We’re now in the Top 4! A win here will guarantee someone a copy of the YCS Prize Card Number 89: Diablosis the Mind Hacker. 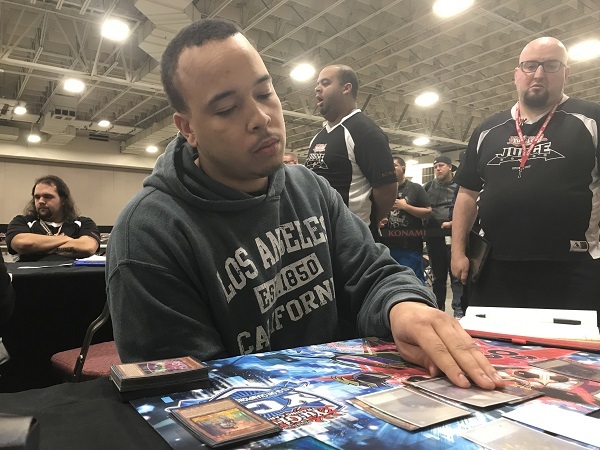 Ayinde Ross from Los Angeles, California ended Swiss in 10th place with an 8-2 record using a 60-card Dinosaur Plant Deck. His opponent is Alessio Giordani from Florence, Italy who ended Swiss with an 8-2 record in 19th place. He’s running a True Draco Deck. Who will make it to the Finals? It’s time to Duel! Ross won the roll and elected to go first. He started with Fossil Dig, adding Souleating Oviraptor from his Deck to his hand. Next, he Normal Summoned Souleating Oviraptor, using its effect to send Overtex Qoatus to the Graveyard, using its effect to add Double Evolution Pill from his Deck to his hand. Next, he activated Double Evolution Pill, banishing Overtex Qoatus form the Graveyard and Fairy Tail – Snow from his hand to Special Summon Ultimate Conductor Tyranno from the Deck ignoring Summoning restrictions. He then activated Left Arm Offering, banishing his hand to add That Grass Looks Greener to his hand, activating it to send 15 cards from his Deck to the Graveyard. Among the cards sent were 2 copies of Mezuki and Shuranui Solitaire. He used one of the Mezukis, banishing it to Special Summon Shuranui Solitaire from the Graveyard. Solitaire’s effect let it Tribute itself to Special Summon Uni-Zombie from the Deck. Uni-Zombie’s effect was used, targeting itself and sending Ash Blossom & Joyous Spring from the Deck to the Graveyard. Next, he used Uni-Zombie and Souleating Oviraptor to Xyz Summon Abyss Dweller! 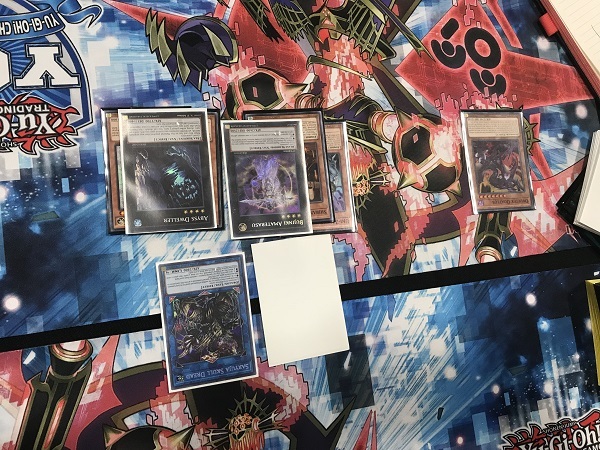 Giordani drew Upstart Goblin, adding it to his hand of Pot of Desires, Unending Nightmare, Amano-Iwato, Master Peace, the True Dracoslaying King, and another Pot of Desires. Ross activated the effect of Abyss Dweller in the Draw Phase. Giordani Normal Summoned Amano-Iwato, then activated Upstart Goblin to draw Disciples of the True Dracophoenix. He activated Pot of Desires, banishing the top 10 cards of his Deck to draw Card of Demise and Forbidden Chalice. He Set Disciples of the True Dracophoenix and Unending Nightmare, then Set Forbidden Chalice and Card of Demise. He flipped the Set Disciples of the True Dracophoenix, then used the effect, Tributing Disciples of the True Dracophoenix and Amano-Iwato for Master Peace, the True Dracoslaying King! Master Peace attacked and destroyed Abyss Dweller, then Giordani used Master Peace, the True Dracoslaying King’s effect to destroy Ross’s Ultimate Conductor Tyranno. In Main Phase 2, Giordani activated Card of Demise, drawing Terraforming, True Draco Heritage, and another Pot of Desires. He used Terraforming to add Dragonic Diagram to his hand and then activated it. Then he activated True Draco Heritage and used the effect to draw another Terraforming. Giordani then used Dragonic Diagram’s effect to destroy his Set Pot of Desires to add Ignis Heat, the True Dracowarrior from his Deck to his hand. He then used Heritage’s effect to Tribute it for Ignis Heat. He Set the rest of his cards and passed. Ross Normal Summoned Heroic Challenger – Thousand Blades. He then banished Mezuki to Special Summon Uni-Zombie and Giordani Chained the effect of Ignis Heat, the True Dracowarrior to add Disciples of the True Dracophoenix from his Deck to his hand. Ross used Master Peace, the True Dracoslaying King’s effect, banishing True Draco Heritage to destroy Uni-Zombie and Ross conceded to go to the second Duel. Ross elected to go first in Duel 2. He Normal Summoned Lonefire Blossom, using its effect to Special Summon another one, then another one, finally ending with Predaplant Ophrys Scorpio, using its effect discarding Heroic Challenger – Thousand Blades to Special Summon Predaplant Darlingtonia Cobra from the Deck. Cobra’s effect let Ross add Brilliant Fusion from his Deck to his hand. Next, Brilliant Fusion was activated, sending Gem-Knight Garnet and Performage Trick Clown to the Graveyard to Fusion Summon Gem-Knight Seraphinite! Trick Clown came out of the Graveyard and reduced Ross to 7000 LP. Heroic Challenger – Thousand Blades activated after that, also coming out of the Graveyard. Next, Ross activated Foolish Burial, sending Performage Damage Juggler to the Graveyard, which was banished to add Performage Hat Tricker to his hand. Hat Tricker was Special Summoned, then Ross used Seraphinite, Hat Tricker, and Heroic Challenger – Thousand Blades to Link Summon Curious, the Lightsworn Dominion. Curious’s effect let Ross send Fairy Tail – Snow to the Graveyard and its other effect sent Mezuki, Evenly Matched, and Soul Charge from the top of Ross’s Deck to the Graveyard. Next, Ross activated Pot of Desires, banishing 10 cards to draw 2 more. He then used Gold Sarcophagus, banishing Ash Blossom & Joyous Spring which will come to his hand in his second Standby Phase. 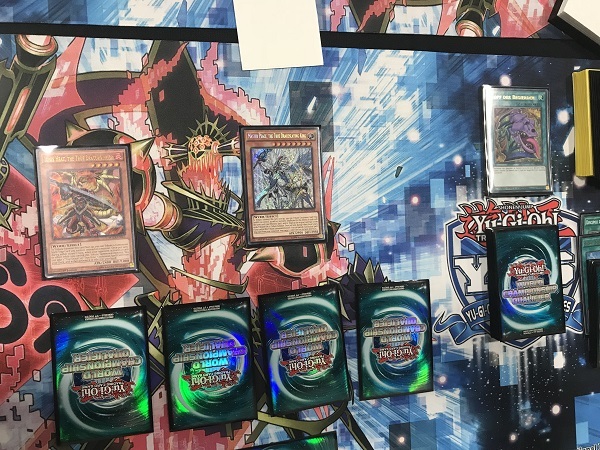 Ross then used all 4 of his monsters to Link Summon Saryuja Skull Dread! He used the effect to draw 4 cards and send 3 back to the bottom of the Deck. 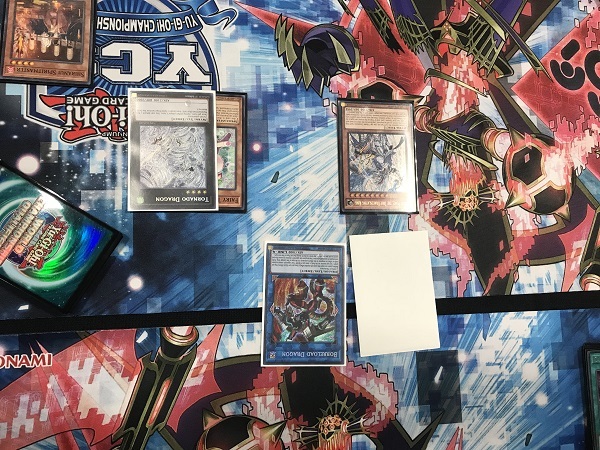 Ross used the effect of Saryuja Skull Dread to Special Summon Shiranui Solitaire from his hand, then he used that effect to Special Summon Uni-Zombie and used its effect to send Shiranui Spiritmaster from the Deck to the Graveyard. He then used Mezuki’s effect to Special Summon that Spiritmaster. He then activated Fairy Tail – Snow from his Graveyard, banishing 7 cards from the Graveyard to Special Summon it. Ross then used Fairy Tail – Snow, Uni-Zombie, and Shiranui Spiritmaster to Xyz Summon Bujinki Amaterasu! He activated the Xyz Monster’s effect, detaching Fairy Tail – Snow to Special Summon the banished Mezuki! He then activated Double Evolution Pill, banishing Lonefire from the Graveyard and an Ultimate Conductor Tyranno from his hand to Special Summon Overtex Qoatus from the Deck ignoring its Summoning restriction. Ross then used Fairy Tail – Snow again, banishing another 7 cards to Special Summon it again. Mezuki and Fairy Tail – Snow were used to Xyz Summon Abyss Dweller. Giordani drew for turn and Ross activated the effect of Abyss Dweller. Giordani’s hand was Card of Demise, True Draco Apocalypse, Pot of Desires, Imperial Iron Wall, True Draco Heritage, and Ignis Heat, the True Dracowarrior. Giordani activated True Draco Heritage. he Set True Draco Apocalypse and used Heritage’s effect, Tributing True Draco Apocalypse to Tribute Summon Ignis Heat, the True Dracowarrior. He then activated Pot of Desires, banishing the top 10 cards of his Deck. Ross Chained Overtex Qoatus to negate it but Giordani Chained Ignis Heat to add Disciples of the True Dracophoenix from his Deck to his hand. Overtex Qoatus was destroyed by its own effect and its Graveyard effect let Ross add Double Evolution Pill from his Deck to his hand. In the Battle Phase, Ignis Heat, the True Dracowarrior attacked into Saryuja Skull Dread, destroying itself and reducing Giordani to 7600. In Main Phase 2, Giordani used Heritage to draw 2 cards. His hand was now Terraforming, Dragonic Diagram, and Card of Demise. He used Terraforming to add another Dragonic Diagram to his hand. 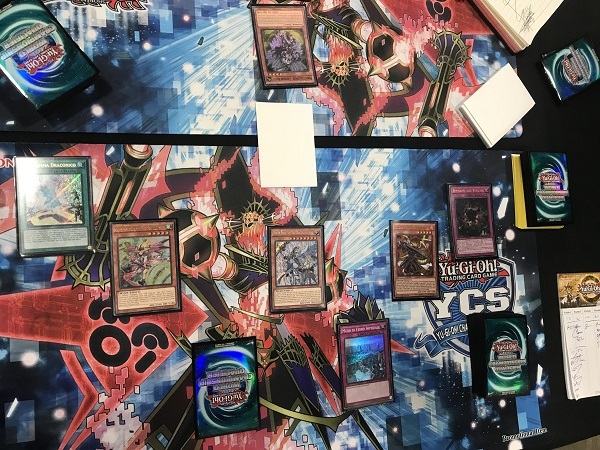 He activated Dragonic Diagram, but Ross Chained Fairy Tail – Snow, banishing 7 cards from the Graveyard to Special Summon it. Among the cards banished was Shiranui Spiritmaster whose effect destroyed Dragonic Diagram. Giordani followed up with another Diagram, using its effect to destroy True Draco Heritage to add Master Peace, the True Dracoslaying King from his Deck to his hand. He then flipped a Set Disciples of the True Dracophoenix, using its effect to send Ignis Heat, the True Dracowarrior, True Draco Heritage, and True Draco Apocalypse from the Graveyard back to the Deck to draw another Disciples of the True Dracophoenix. He used the effect of Disciples of the True Dracophoenix to Tribute Summon, sending Disciples of the True Dracophoenix and Imperial Iron Wall to the Graveyard to Summon Master Peace, the True Dracoslaying King. He used Master Peace’s effect to destroy Bujinki Amaterasu. He Set Disciples of the True Dracophoenix and Card of Demise and passed. Ross used Abyss Dweller’s effect. He then used Mezuki, banishing it from the Graveyard to Special Summon Uni-Zombie from the Graveyard. Giordani activated the effect of Master Peace, the True Dracoslaying King to destroy Uni-Zombie immediately when the Zombie was Summoned. Ross used Fairy Tail – Snow, Spiritmaster, Dweller, and Saryuja Skull Dread to Link Summon Borreload Dragon! He used Borreload to attack and steal Master Peace, the True Dracoslaying King from Giordani, then used Master Peace to attack directly! He then used Fairy Tail – Snow’s effect in the Battle Phase to empty his Graveyard and hand to Special Summon Snow. With a combination of Shiranui effects, Giordani’s Dragonic Diagram was destroyed and Spiritmaster was Special Summoned. Both new monsters attacked directly and in Main Phase 2, Fairy Tail – Snow and Spiritmaster were used to Xyz Summon Tornado Dragon! Its effect destroyed Giordani’s Set Card of Demise. Giordani drew Pot of Desires. He conceded the game and we’re going into the third and final Duel! Giordani elected to go first in Duel 3. He started with a hand of Imperial Iron Wall, Dimensional Barrier, Terraforming, Upstart Goblin, and Disciples of the True Dracophoenix. He activated Terraforming, adding Dragonic Diagram to his hand. He activated Upstart Goblin, drawing Master Peace, the True Dracoslaying King. He then activated Dragonic Diagram, Set Disciples of the True Dracophoenix, and activated Dragonic Diagram’s effect, destroying the Master Peace, the True Dracoslaying King from his hand to add True King’s Return from his Deck to his hand. He Set all 4 cards and passed. In Ross’s Standby Phase, Giordani activated Imperial Iron Wall. Ross Normal Summoned Lonefire Blossom, using its effect to Special Summon the second, then using that for the third, then using that to Special Summon Predaplant Ophrys Scorpio, then using that effect to discard Fairy Tail – Snow and Special Summon Predaplant Darlingtonia Cobra from the Deck. Cobra’s effect added Brilliant Fusion from his Deck to his hand. Time in the round was called at this point. He used both Plants to Xyz Summon M-X-Saber Invoker. He used the effect, detaching Predaplant Darlingtonia Cobra to Special Summon Heroic Challenger – Thousand Blades from the Deck in Defense Position. He used both monsters to Link Summon Missus Radiant. Ross activated Brilliant Fusion and Giordani Chained Dimensional Barrier, declaring Fusions! Ross attempted to attack with Missus Radiant but Giordani activated True King’s Return, Special Summoning Master Peace, the True Dracoslaying King from the Graveyard in Defense Position. Ross Set one card and passed. Giordani drew Pot of Duality. He activated it, revealing, Master Peace, the True Dracoslaying King, True Draco Heritage, and Terraforming. He picked True Draco Heritage, sending the other cards back into the Deck. He used Dragonic Diagram’s effect, destroying his Set Disciples of the True Dracophoenix to add Majesty Maiden, the True Dracocaster to his hand. He used Disciples of the True Dracophoenix’s Graveyard effect to destroy Ross’s Set Double Evolution Pill. Giordani used Heritage’s effect to draw True Draco Apocalypse. He then Tributed True Draco Heritage to Tribute Summon Majesty Maiden, the True Dracocaster. 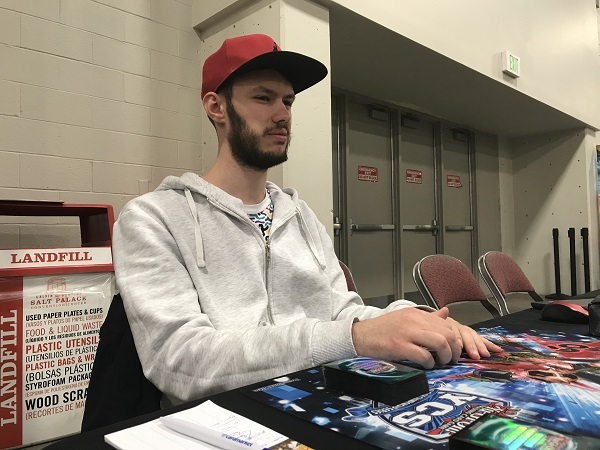 Majesty Maiden, the True Dracocaster attacked and destroyed Missus Radiant whose effect let Ross add M-X-Saber Invoker back to the Extra Deck. Master Peace attacked directly. By taking damage, Ross used Heroic Challenger – Thousand Blades to Special Summon it from the Graveyard. Giordani Set True Draco Apocalypse and passed. Ross Normal Summoned Shiranui Solitaire and used its effect, but Giordani Chained Majesty Maiden, the True Dracocaster’s effect to add Ignis Heat, the True Dracowarrior from his Deck to his hand. Ross Special Summoned Uni-Zombie from the Deck with Solitaire’s effect. Giordani used the effect of True King’s Return, Tributing it to Tribute Summon Ignis Heat, the True Dracowarrior. True King’s Return’s Graveyard effect destroyed Uni-Zombie and Ross extended the handshake! Giordani moves onto the finals!